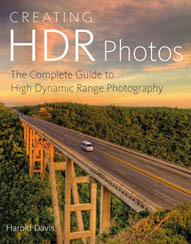 Among his multifarious skills—photographer, author, publisher, post-processing whiz, blogger, teacher and workshop leader—Harold Davis is the acknowledged maestro of HDR imaging. (See Rangefinder September, 2012). In Monochromatic HDR Photography, Davis brings another technique for dynamic range manipulation: taking color out and putting artistry in. His comprehensive and readable creative tips, his workflow regimen and his powerful imagery will ignite (or reignite) your interest in black-and-white conversions with any subject you shoot. You’ll see Ansel Adams’ tonal spectrum appear in your landscapes and Edward Weston’s luminosity in your portraits. Welcome to yet another Davis title that belongs in your digital darkroom. The red flowering quince are particularly gorgeous this year in my neighborhood, and I can’t resist putting some of them on my light box. These flowers have a simple elegance that is really special. Do you prefer the version of this image with the moon (above) or just the branch of flowering quince (far above)? My friend Hermann Will of Fine Art Printer Magazine sent me a snapshot, shown here on Facebook, of my Red Poppies print on kozo washi at the Awagami exhibit in Frankfurt. Click here to see the Facebook Post by FineArtPrinter. It’s wonderful for me to see the conjunction of my work in Germany with Hermann and Fine Art Printer Magazine, which has featured my Botanique and reviewed my Monochromatic HDR book, and also with Awagami and my friend Aya Fujimori, who was so kind to me when I visited Japan recently. There is truly something very satisfying about this conjunction of worlds—with work by an American artist (that would be me!) on traditional paper from Japan that has been modified for modern inkjet printers exhibited in Germany, and sent to me by a German friend! There are only a few spaces remaining in the February 22-23, 2014 Photographing Flowers for Transparency workshop here in Berkeley, Ca. Don’t miss this unique opportunity! There are no plans to give this workshop again in the United States until 2015, and there is nowhere else you can learn the techniques I have pioneered for photographing and processing flowers for transparency on a light box. As workshop size is strictly limited, to avoid disappointment don’t delay. Here’s the registration link for this opportunity. Also please note two free presentations, The Art & Craft of Photography in Berkeley, CA on February 8, and Making the Botanical Photo: The Digital Print as Artifact at PHOTO Fine Art Photography in Oakland on June 7. You can also join my ongoing Photographing Flowers online workshop via this link (and get $10 off the normal full price of $59.95). Finally, registration is now available for my two courses over the summer in Heidleberg, Germany at the Heidelberger Sommerschule der Fotografie. Click here for Creative Flower Photography, and here for Creative Black & White Masterclass. Please consider joining me for some exciting photography in charming Heidelberg. 2012.02.08—Free event at The Lighthouse in Berkeley, CA. Harold Davis presents “The Art and Craft of Photography.” Click here for more information. 2014.02.22—2014.02.23—Photographing Flowers for Transparency: Two Day Workshop with Harold Davis—a unique opportunity to learn Harold’s techniques, workshop location is Berkeley, California (Limited space availability, click here for information and registration). 2014.04.12—2014.04.13—Advanced Black and White Photography and Photoshop—This workshop includes field photography in several Bay area locations, monochromatic HDR shooting techniques in the field, black & white conversion in Photoshop and Nik Silver Efex, and monochromatic HDR processing. Click here for information, curriculum and registration. 2014.05.31—2014.06.01—Mastering Creative Photoshop: The Way of the Digital Photographer—This workshop covers developing a personal digital Photoshop workflow. Topics explained in detail include archiving and checkpoints, RAW processing, multi-RAW processing, HDR, hand-HDR, stacking, LAB color creative effects, using backgrounds and textures, layers, layers masks, working with channels, Photoshop filters, and plugins from Nik Software and Topaz—Click here for information and registration. 2014.06.07—Free event at Photo Oakland: Harold will show his botanical prints and discuss “Making the Botanical Photo: The Digital Print As an Artifact.” Click here for more information about the event. 2014.6.27-2014.6.30—I will be teaching Creative Flower Photography at Summer School in Heidelberg, Germany from June 27 – June 30, 3014. Click here for more information about Heidelberger Sommerschule der Fotografie, here for workshop information and curriculum, here for nearby hotel information (with special participant discounts), and here to register for enrollment. 2014.7.04-2014.7.07—I will be teaching a Creative Black & White Masterclass at Summer School in Heidelberg, Germany from July 4 – July 7, 3014. Click here for more information about Heidelberger Sommerschule der Fotografie, here for workshop information and curriculum, here for nearby hotel information (with special participant discounts), and here to register for enrollment. 2014.08.01-2014.08.03—Night Photography in the Big Sur Landscape sponsored by the Center for Photographic Art in Carmel, CA. Link for details and registration to follow. 2014.08.08-2014.08.10—Creative Landscape Photography in Point Reyes sponsored by the Point Reyes Field Institute. Link for details and registration to follow. 2014.11.04-2014.11.20—Photography Caravan to Morocco (with Bill Bachmann). Details and registration link to follow. Also of note: We are in the planning stages for two destination workshops: Morocco Photographic Caravan in November 2014, and off-the-beaten track Japan in the spring of 2015. The adventure to Morocco will start in Barcelona, head down the southern coast of Spain, and with a pause to take in the Rock of Gibralter will cross over to Africa. Highlights will include a stay in the Sahara under the stars with time for night photography and camel rides. The group will be co-led by well-known commercial and travel photographer Bill Bachmann, who will help partipants learn how to make money from the photos they shoot. Wanted: A few photographers for serious fun! Can you handle photographing Paris in April? Are you serious about your photography and looking to have fun with it in an environment that has nurtured artists over the centuries? Are you ready for a great learning experience in the company of a master photographer and educator in a group of dedicated colleagues? Are you ready to have fun with your photography?? April 26 – May 4, 2014. Click here to register now! Photography begins with the medium of light, which the artist captures and applies to the canvas in endlessly surprising ways. And what better place to explore this medium than in Paris, the City of Light, and one of the birthplaces of photography? We’ve included many of the highlights from previous workshops, such as the visit to Monet’s garden at Giverny with after hours access (a personal favorite! ), as well as new places to explore. If you check out the itinerary, I think you’ll find many wonderful locations, such as the view from the top of the Tour Montparnasse at night, Père Lachaise, and Vaux-le-Vicomte. The workshop cost is $5,639.00, excluding airfare. The workshop fee includes eight nights in a delightful 4-star hotel as well as numerous excursions and extras. We’ve got great deals on the hotel and excursions—if you reserved these on your own you’d pay more—even without Harold’s teaching fee for eight days and nights! Click here for the complete itinerary, terms and conditions, and online registration. For information and registration links for Harold Davis workshops, please go to http://www.digitalfieldguide.com/about/workshops-events. Harold Davis is an internationally-known digital artist and award-winning professional photographer. He is the author of many photography books. His most recent titles are The Way of the Digital Photographer (Peachpit) and Monochromatic HDR Photography (Focal Press). In addition to his activity as a bestselling book author, Harold Davis is a Moab Master printmaker and a Zeiss Lens Ambassador. Harold Davis’s work is widely collected, licensed by art publishers, and has appeared in numerous magazines and other publications. His black and white prints are described as “hauntingly beautiful” [Fine Art Printer Magazine] and his floral prints have been called “ethereal,” with a “a purity and translucence that borders on spiritual” [Popular Photography]. Heading into Grace Cathedral in San Francisco, my idea was to practice HDR photography on the vaulted ceiling of the church. I had done this once before in Grace Cathedral, and also in other churches, such as the Cathedral in Chartres, France (shown here in monochromatic HDR). Often the best laid plans of photographers “go awry,” which is the best reason I can think of for living one’s life to carpe diem, or to seize the day, which all photographers should do as often as they can. In this case, the interior of Grace Cathedral was taken over by “Graced with Light,” an art installation by Anne Patterson that features some twenty miles of multi-colored ribbons dangling from the church’s ceiling. I sat down in a pew, and attached my camera to the tripod. The legs were collapsed, so the tripod was low to the ground. I positioned the camera and tripod in the center of the center aisle, and pointed it up and back towards the rose window above the entrance to Grace Cathedral. I wanted the image to be entirely in focus, so I needed a fair amount of depth-of-field. This implied stopping down (to f/18), which in turn compelled a fairly long duration of time (15 seconds) for the shutter speed. Still seated in the pew, I tripped the shutter using my intervalometer, and gave thanks for the grace that allows me to see images that interest me and show the beauty of the world, and of places that people hold sacred. Exposure data: Nikon D800, 28-300mm lens at 28mm, 15 seconds at f/18 and ISO 100, tripod mounted, RAW file multi-processed in Adobe Camera RAW and finished in Photoshop. Special thanks to Jake, without whom I would not have been at Grace Cathedral to make this image. Wandering the pedestrian walk on new San Francisco Bay Bridge span in the waning days of the year, I shot this directional arrow, intended to guide foot and bike traffic, straight down and broken up by strong shadows from the railing. The last big step is to align the two LAB inversions as layers in one image, and set the Blending Mode to Difference (by the way, they have to be back in RGB, or the Difference mode isn’t available). To learn more about the LAB color techniques for creative image making I have pioneered, check out The Way of the Digital Photographer (pages 156-163) and The Photoshop Darkroom (pages 148-201). If this really intrigues you, you may want to consider my Mastering Creative Photoshop workshop (January 25-26, one last minute spot available, more space in the second session, May 31 – June 1, 2014). I am proud of my online Photographing Flowers course at Craftsy.com, which by now has more than 500 students. The variety, exuberance and quality of the student projects shows that I (and the production team that worked with me) did something right in this online offering. Click here to check out my Photographing Flowers course (the course cost is normally $59.99, but by using this link you can get $10 off!). Craftsy classes are yours to keep–watch any time and as many times as you like. My course won’t expire, and you can watch it piecemeal, when you like, and when you want to learn about a specific subject. Classes are interactive, so you can ask me and your classmates questions. The Craftsy production team did a great job of making high quality videos. Craftsy classes are filmed in high definition so technical details are easy to see. Every class is equipped with helpful features like video notes and 30-second repeat. You can share projects for feedback and tips,or browse for inspiration. If for any reason you aren’t satisfied, return your class and Craftsy will refund your money. When all is said and done, if you like to photograph flowers and want to learn more photographic technique, for $60 I think this is a pretty good deal! Click here to check out my Photographing Flowers course (the course cost is normally $59.99, but by using this link you can get $10 off!). The first session of Mastering Creative Photoshop is sold out…and so many people have asked for another session. Here it is!!! The dates are Saturday May 31 – Sunday June 1, 2014. To avoid disappointment, please register well in advance. Workshop Description: Mastering Creative Photoshop: The Way of the Digital Photographer—This workshop covers developing a personal digital Photoshop workflow. Topics explained in detail include archiving and checkpoints, RAW processing, multi-RAW processing, HDR, hand-HDR, stacking, LAB color creative effects, monochromatic conversions, using backgrounds and textures, layers, layers masks, working with channels, Photoshop filters, and plugins from Nik Software and Topaz. If you’ve ever wondered how Harold does it, or wanted to learn how to incorporate his techniques in your own digital workflow, this is the workshop for you! Location: Berkeley, California. The workshop will be held at the MIG Meeting Room, which is a very nice space co-located with a well-known green urban design firm in Berkeley, CA and conveniently located near the Fourth Street shopping district, the Berkeley Amtrak station, and the University Ave exit from Interstate 80. Space Availability: Class size is strictly limited to 16 to permit individual attention. To avoid disappointment please do not delay. Saturday was a gray and moist day in Berkeley, California. I took the kids out to a playground up higher in the coastal range, and all of a sudden we were in the middle of a cloud, with light but persistent precipitation. While the kids played in the sand, I used the camera app on my iPhone to snap a photo of the eucalyptus trees in the fog. Standing under a sheltering tree, I processed the image on my iPhone in about five minutes, using Filterstorm, Plastic Bullet, and the 60s Square Virage filter from Lo-Mob. I don’t think my need for high resolution, an optical viewfinder, and a variety of “real” lenses is likely to be satisfied anytime soon by my iPhone camera—but what you can do on a mobile “fun” is great and pleasing in its own right! About the time I finished processing, the day grew even wetter—and by parental fiat we decided to bag the playground before everyone got soaked to the bone. I lit a passion flower (passiflora) from the rear and left, so that the light reflected off the flower onto the neck of a glass bottle with a rather tall neck. I used a telephoto macro lens (200mm) to shoot the passiflora through the neck of the glass bottle. My idea was to focus on the refraction of the flower projected onto the glass rather than the flower itself. I used a moderate aperture (f/10) for some depth-of-field—enough to make the refraction of the flower in the glass seem to be in focus, but not enough for the actual flower in the background to seem sharp. What makes this image interesting is the inversion of normal visual expectations. In other words, the contrast between the “straight” flower in the background—which is normal and ordinary, but not in focus—and the distorted flower in the glass—which is contorted and extraordinary, but in focus—is unusual. We normally expect to see our “straight” things crisp and in focus, and our weird, dream-like things out-of-focus and, well, dream-like. 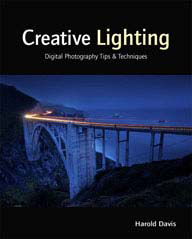 I’m glad many photographers have found my books inspiring and useful. Thanks everyone who has taken the time to write a review, it is greatly appreciated—and helps me to continue doing what I do! As an exercise, and also to participate in a compendium of “best of” blogged photos, I’ve put together what I think are my best photos from 2013. This has been an exciting and varied year of photography for me, with locations both abroad and at home. It’s never an easy job editing one’s own photos. My favorite photo is always my next one! I love them when I make them, but then they fall out of favor, and it takes a while before I can see them clearly. You have to let go of the feelings you had when you took the image, and begin to view them objectively: often not the easiest thing to do. I also had a problem of definition: does an image made in 2013 count, or does it have to be photographed in 2013? This is an issue for me because many of my images are made from photos shot in earlier years. For the sake of this collection, I am sticking with images using only photos shot in 2013 (I have no shortage of those! ), but this does mean omitting some composite imagery that I like. How do you compare apples to oranges? Are you in the mood for botanicals or landscapes? This is all very subjective, but basically these are my picks (with a little input from Phyllis). I also used favoriting on Flickr as a data point (but certainly didn’t rely solely on Flickr feedback). What do you think? Which are your favorites? Have I omitted an image of mine that should be included (or vice versa)?